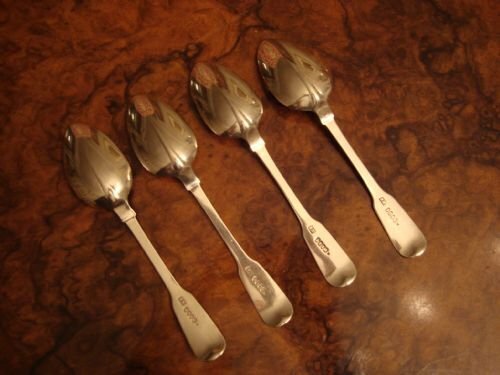 Dublin 1824 set of four Irish solid silver teaspoons made by Samuel Neville. 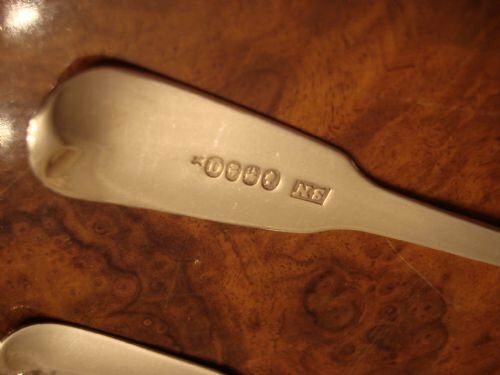 Dublin 1824, George IV period Irish hallmarked solid silver set of 4 teaspoons in the Fiddle Pattern with typical Irish rattail to the bowl. 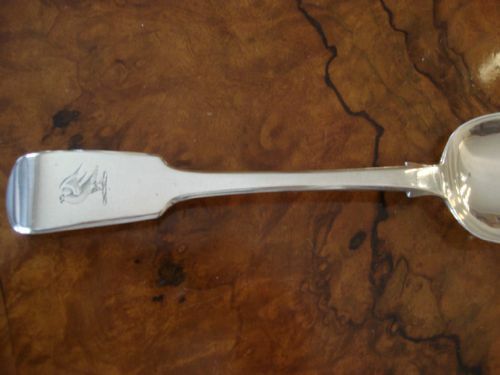 Made by Samuel Neville, flatware maker. 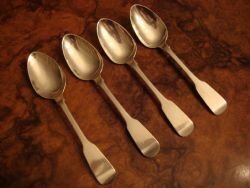 A nice set of spoons to use or to complete an existing canteen. With a few marks to some bowls, these are in very good antique condition overall. Irish silver is very collectable, and much sought after, as it is much more scarce than English silver. 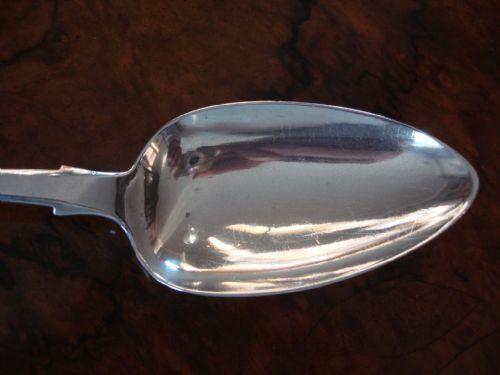 Wonderful Irish solid silver Dublin 1834 hallmarked large table spoon with family armorial. 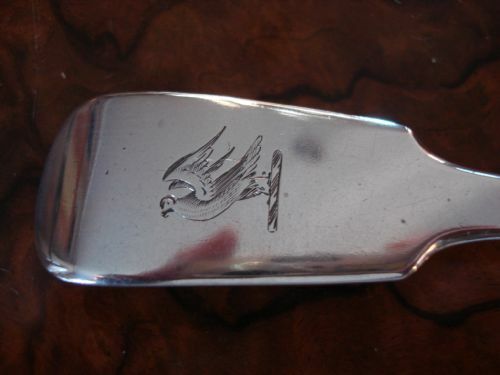 Dublin 1834 hallmarked sterling silver serving or table spoon in the fiddle pattern with lovely family armorial crest of a great winged bird on the stem. With little use in its lifetime, the shoulders and bowl point are still sharp. Size-8 7/8 inches long by 1 7/8 inches wide. 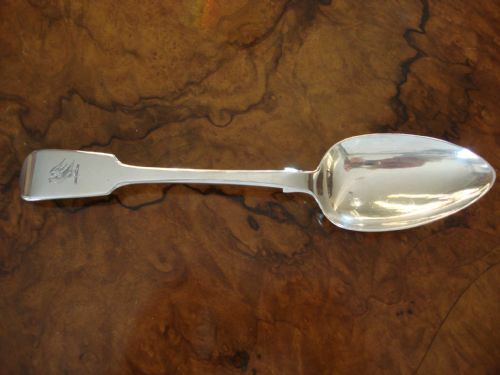 This William IV period spoon is both beautiful and functional for serving food, to complete a canteen, or makes a great wedding or Christening gift or a present for a collector. Irish silver being more scarce than English silver is very sought after and collectable on its own. 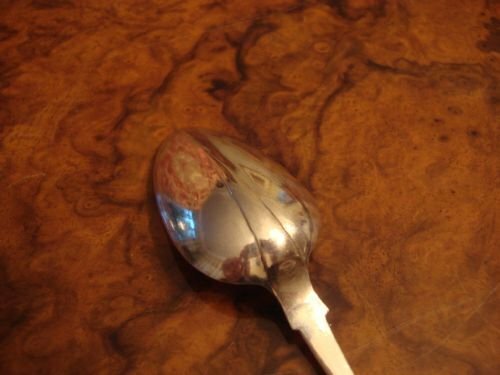 This spoon is heavy in weight and thick in gauge, and has very clear hallmarks. With just one small flat spot near the heel of the bowl, it is a great example at nearly 200 years old, in very good antique condition. Dublin 1918 stunning Irish hallmarked silver egg cup and spoon by famous makers WEST & SONS in original fitted case. Dublin 1918 Irish hallmarked solid silver very unusual egg cup and matching spoon made and retailed by famous makers West & Son of Dublin, in the original fitted case. Of heavy gauge, and with applied design of celtic knots and interlacing spirals, the cup and beautiful matching egg spoon are rare to find. Irish silver is very sought after, due to its rarity. 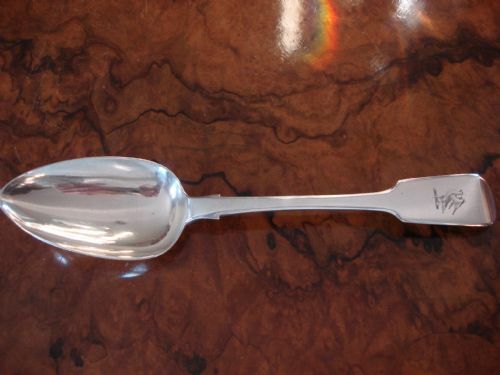 Size-cup-2 inches diameter by 2.25 inches high; spoon-4.25 inches long by 1 inch wide. Box cup and spoon all bear West & Sons marks. A very high quality complete and rare set for the collector of Irish silver, or a wonderful gift. 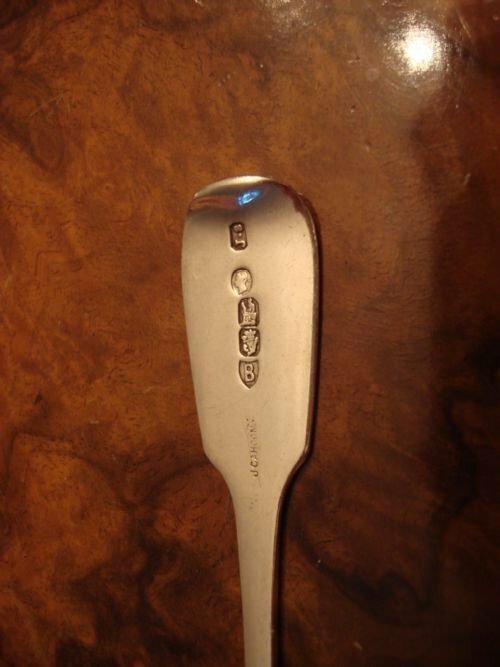 Dublin 1935 Irish hallmarked solid silver set of cased coffee spoons with golf theme, made by WEST & SONS. Dublin 1935 cased set of 6 Irish hallmarked solid silver heavy gauged coffee spoons decorated with crossed golf clubs and golf ball to terminals and enclosed in the original fitted case. Irish silver is very collectable, and the golf theme also make these a very nice gift for the golf enthusiast. Makers are likely West or Weir and Sons, well known makers. Weight-90 grams. 290 grams with case. A lovely set in very good condition, and in the original fitted case. We have many other individual and sets of spoons in inventory, so please contact us with your requirements. Dublin 1818 Irish Georgian solid silver condiment shovel with interesting family crest. Dublin 1818 very unusual Irish solid silver shovel shaped condiment spoon with original gilt to bowl, and very interesting boot family crest. Made by Thomas Townsend, with very clear hallmarks. 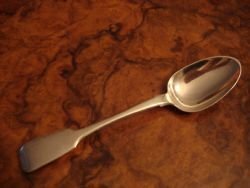 A rare and very interesting Georgian Irish solid silver spoon in very good condition at 192 years old! Irish silver is very sought after. 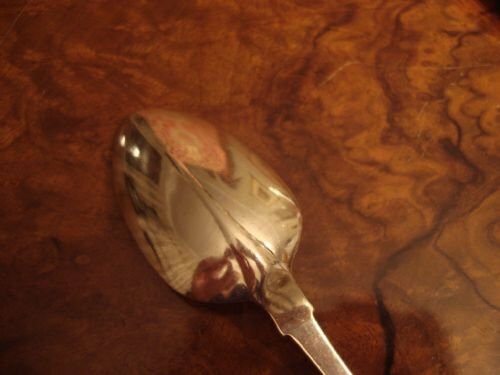 Dublin 1872 Irish hallmarked solid silver fiddle pattern rattail bowled teaspoon made by John Smyth. 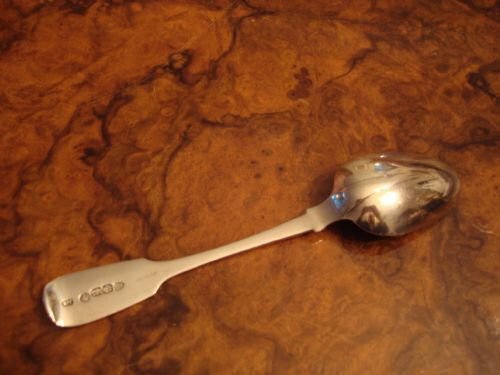 Dublin 1872 Irish hallmarked solid silver Victorian period lovely teaspoon made in the fiddle pattern with crisp rattail bowl, and very clear hallmarks. 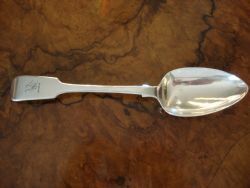 Made by John Smyth, know maker of quality flatware. Also with the mark of retailer J Cahoon. With the point of bowl still crisp, and only the usual light surface scratching, this has had very little use in its lifetime. This is free of personalisation, but could be engraved as a gift if desired. Slightly longer and heavier than English examples, this is a lovely spoon to add to a canteen or to give as a gift. A lovely Irish silver teapsooon in very good condition.